he catamaran is a 18 meters long and 7 ½ meters wide sailing boat, designed and built by Derek Kelsall. We can offer you the two master cabins with queen size double bed and a single bed plus three very comfortable double bed cabins. 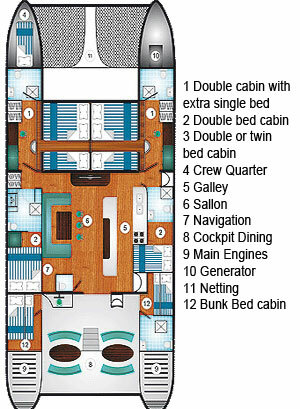 All cabins offer en-suite facilities, household size electric toilets and fans. The salon is huge accommodating the galley with a bar. Opposite the galley is ample seating, but the best place is the seating arrangement in the cockpit area, which consists of two tables and comfortable seating for twelve guests.